ELA.RF.3.3b: Decode words with common Latin suffixes. 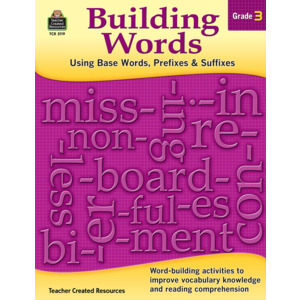 ELA.RF.3.3d: Read grade-appropriate irregularly spelled words. Engage effectively in a range of collaborative discussions (one-on-one, in groups, and teacher-led) with diverse partners on <i>grade 3 topics and texts</i>, building on others&rsquo; ideas and expressing their own clearly. ELA.SL.3.1d: Explain their own ideas and understanding in light of the discussion. ELA.L.3.1e: Form and use the simple (e.g., I walked; I walk; I will walk) verb tenses. ELA.L.3.1b: Form and use regular and irregular plural nouns. ELA.L.3.1g: Form and use comparative and superlative adjectives and adverbs, and choose between them depending on what is to be modified. ELA.L.3.2g: Consult reference materials, including beginning dictionaries, as needed to check and correct spellings. ELA.L.3.2f: Use spelling patterns and generalizations (e.g., word families, position-based spellings, syllable patterns, ending rules, meaningful word parts) in writing words. ELA.L.3.2e: Use conventional spelling for high-frequency and other studied words and for adding suffixes to base words (e.g., sitting, smiled, cries, happiness). ELA.L.3.4d: Use glossaries or beginning dictionaries, both print and digital, to determine or clarify the precise meaning of key words and phrases. ELA.L.3.4c: Use a known root word as a clue to the meaning of an unknown word with the same root (e.g., company, companion). ELA.L.3.5b: Identify real-life connections between words and their use (e.g., describe people who are friendly or helpful).